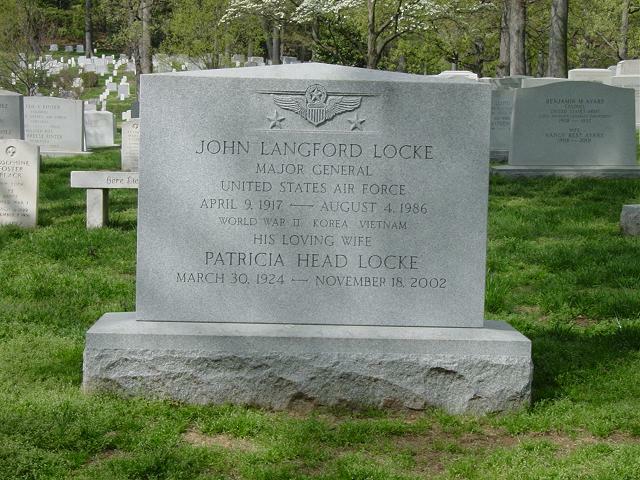 Major General John Langford Locke was commander, Headquarters Command, U.S. Air Force, Bolling Air Force Base, Washington, D.C. This command is one of the most diversified of the major commands in the U.S. Air Force providing operational support to Headquarters U.S. Air Force, the Organization of the Joint Chiefs of Staff, the Office of the Secretary of Defense and other governmental agencies on a worldwide basis. academy in 1941, he entered flying training and received his pilot wings at Kelly Field, Texas, in March 1942. In October 1943 General Locke became commander of the 512th Fighter Bomber Squadron, and in March 1944 went with his squadron to England and later to France, Belgium, and Germany. On D-Day, June 6, 1944, he led the first American fighter aircraft units across the English Channel in support of the Normandy beachhead. A few days later, during the breakout from the beachhead, he earned the Silver Star for gallantry in action. Later, while supporting General George Patton's famous drive across France, General Locke was shot down behind enemy lines, but managed to evade capture and return to his fighter group. In March 1945 he became assistant director of operations for the 29th Tactical Air Command, and in September 1945 he assumed command of the 368th Fighter Group. While in Europe he flew 329 combat hours and completed 126 combat missions in fighter aircraft. He returned to the United States in December 1946 and was assigned as deputy chief of the Civilian Institutions Division at the Air University, Maxwell Field, Alabama From July 1947 to April 1949 he attended Stanford University, Palo Alto, California, where he was awarded a master's degree in business administration. General Locke was then assigned as assistant chief of the Promotions and Separations Division, Directorate of Military Personnel, Headquarters U.S. Air Force, with additional duty as a White House aide. In August 1951 he became assistant secretary of the Air Force Council, Headquarters U.S. Air Force, where he remained until he was selected to attend the Air War College in August 1952. In 1953 General Locke assumed command of the 8th Fighter Bomber Group in Korea. In May 1954 he returned to the United States as captain of the Far East Air Forces Day-Fighter Gunnery Team to participate in the Worldwide Gunnery Meet at Nellis Air Force Base, Nevada. This team placed third. His next assignment was base commander of Kinross Air Force Base, Michigan, and commander of the 507th Fighter Group. In July 1956 he went to Headquarters Air Defense Command, Ent Air Force Base, Colorado, as director of military personnel, and in September 1958 he assumed duties as assistant deputy chief of staff, personnel, ADC. In July 1960 General Locke assumed command of the Phoenix Air Defense Sector, Luke Air Force Base, Arizona. He returned to Headquarters U.S. Air Force in 1961 as chief of the Promotions and Separations Division, Directorate of Military Personnel, and subsequently became deputy director of military personnel. He became chief of the Air Force Section, Military Assistance Advisory Group, Iran, in July 1965. General Locke assumed duties as deputy chief of staff, Technical Training, Air Training Command, Randolph Air Force Base, Texas, in August 1967. In August 1969 he returned to Headquarters U.S. Air Force with assignment as assistant deputy chief of staff for personnel. On May 1, 1972, General Locke was assigned as commander, Headquarters Command, U.S. Air Force, at Bolling Air Force Base, Washington, D.C.
Vermeil, Belgian Officer de'odre de la couronne, and the Belgian Croix de Guerre 1940 avec Palme. He was promoted to the temporary grade of Major General effective July 1, 1967, with date of rank July 2, 1962. General Locke was buried with full military honors in Section 30 of Arlington National Cemetery.